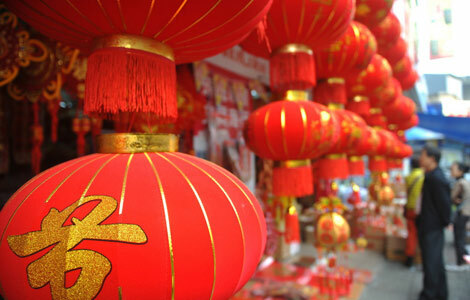 Chinese New Year is celebrated for sixteen days ( from New Year’s Eve to the Lantern Festival ). It is on the 5th of February 2019, beginning a year of the Pig. 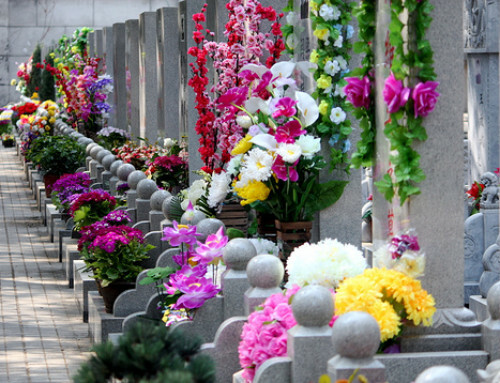 China’s public holiday will be February 4–10, 2019. How Chinese people celebrate Chinese New Year？Its preparations begin a couple of weeks before the big day. This is a fun time full of anticipation and joy as we get ready for the thrill and excitement of the celebrations. Different parts of China have very different traditions. Small year is the 23th of the last month of the year. 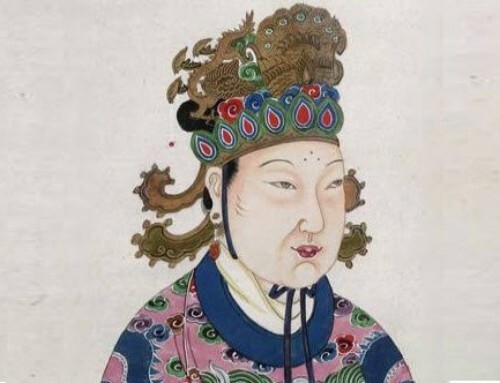 It is said that the food god will leave the family on the day in order to go to heaven and report the activity of family to the Emperor of the heaven. People will follow religious ceremony to say farewell to the food god, including taking down and burning the paint of the food god. After the New Year’s Day, people will buy new paint of the food god and display it in the kitchen. 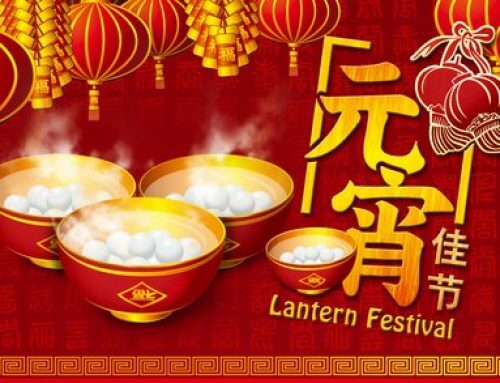 From the 23rd of the 12th lunar month, A few days before the Chinese New Year, people will do a complete cleaning of the house and house wares which signifies to remove the old and welcome the new. The cleaning is called “sweeping the dust”, and represents a wish to put away old things, bid farewell to the old year, and welcome the New Year. People buy New Year food and snacks, New Year decorations, and clothes for New Year before New Year’s Eve. 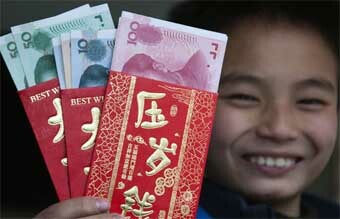 Chinese New Year is a shopping boom time. For example, they buy everyone new clothes for the festival, whether they need them or not. There are New Year street markets on the days before the festival. 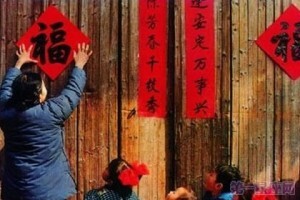 Pasting a door god image on the door is an important custom among Chinese people during Spring Festival. 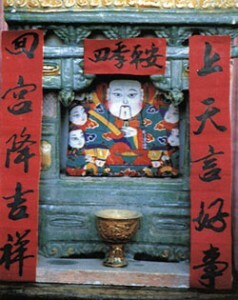 In the beginning door gods were made of peach wood carved into the figure of a man, hanging by the door. Later people pasted printed images on doors. People paste door gods on doors as a prayer for blessings, longevity, health, and peace. Two door gods on double doors are thought to keep evil spirits from entering. 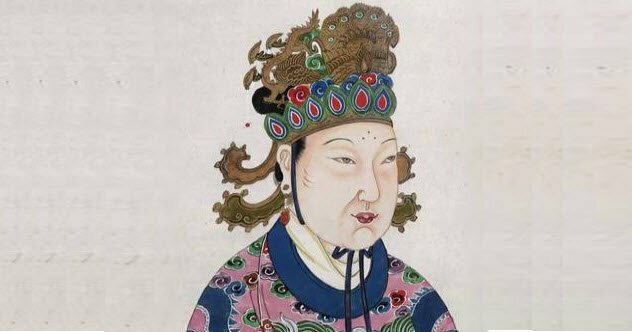 The door gods symbolize righteousness and power in China, therefore Chinese door gods are always scowling, holding various weapons, and ready to fight with evil spirits. Spring couplets or New Year couplets (春联: Chūnlián /chwn-lyen/) are paired phrases, typically of seven Chinese characters each, written on red paper in black ink, and pasted one each side of a door frame. Sometimes a phrase of four or five characters is affixed to the top of the door frame as well. 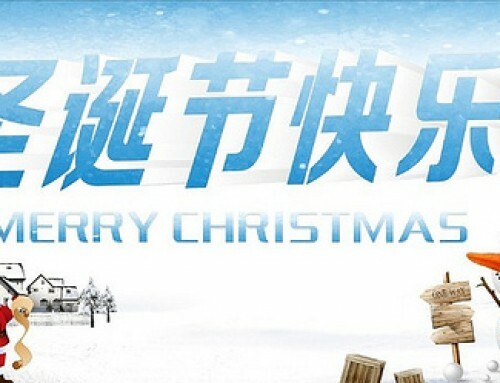 New Year couplets are filled with best wishes. Some people write the couplets themselves, but most people buy them (ready printed) from the market. Pasting spring couplets is thought to keep evil away. 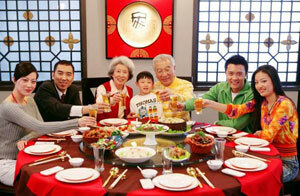 Chinese New Year is a time for families to be together. Wherever they are, people come home to celebrate the festival with their families. The New Year’s Eve dinner is the most important dinner for the Chinese. Big families of several generations sit around round tables and enjoy the food and time together. During the dinner, normally fish will be served. Dumplings (jiaozi) are the most important dish in Northern China. These two dishes signify prosperity. Other dishes are dependent on personal preference. It’s become a China custom for many familes to watch the CCTV New Year Gala while having their dinner. The Gala starts at 8pm and ends at midnight when the New Year arrives, featuring traditional, folk, and pop performances from China’s best singers, dancers, and acrobats. Parents usually give their children red envelopes after the reunion dinner, wishing them health, growth, and good studies in the coming year. Money in red envelopes is believed to bring good luck, as red is China’s lucky color, so it’s called lucky money,money ranges from one to a few thousand Chinese Yuan. Usually the red racket is given by adults, especially married couples, and elderly to young children in the New Year days. It was believed that the money in the red packet will suppress the evil from the children, keep them healthy, and give them a long life. This custom is called shousui (守岁 /show-sway/ ‘to keep watch over the year’). 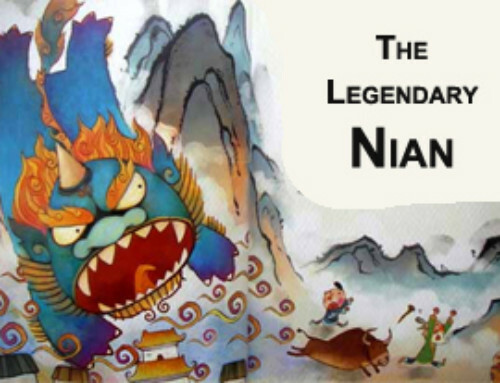 Chinese stayed up all night in the past, but now most stay up only till the midnight firecrackers and fireworks die down. Shou Sui means “after the New Year’s Eve dinner” as family members will normally stay awake during the night. Some people just stay up until the midnight after the fireworks. 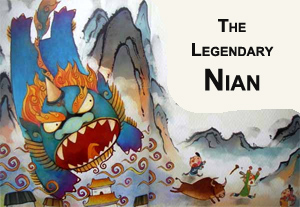 According to tales and legends, there was a mythical beast named the “Year”. At the night of New Year’s Eve, the “Year” will come out to harm people, animals, and proprieties. Later, people found that the “Year” is afraid of the color red, fire, and loud sounds. Therefore, at the New Year’s Eve night, people will launch fireworks, light fires, and stay awake the whole night to fend off the “Year”. Setting off firecrackers and fireworks (放鞭炮 fàng biānpào) –Goodbye old year, Welcome New year! 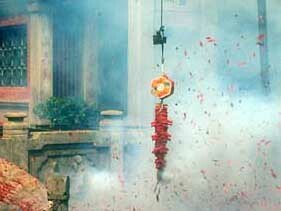 It has long been a Chinese tradition to set off firecrackers when the New Year clock strikes. Firecrackers are used to drive away the eveil in China, right after 12:00PM on New Year’s Eve, fireworks will be launched to celebrate the coming of the New Year as well as to drive away the evil. The tradition is to set off one string of small firecrackers first, followed by three big firecrackers, which symbolize “sounding out” the old year and “sounding in” the new year. The louder the three firecrackers, the better and luckier it’s believed it will be for business and farming in the coming year. Traditionally a married daughter visits the house of her parents on the second day of Chinese New Year. Chinese visit relatives and friends during the holiday. 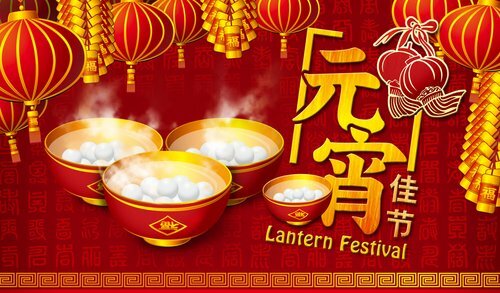 The fifteenth day of the New Year is the Lantern Festival (元宵节 Yuánxiāo Jié /ywen-sshyaou jyeah/), making the end of the Chinese New Year Lantern Festival is celebrated on the 15th day of the first month of traditional Chinese calendar, marking the end of the New Year holiday.